Approved to drive means Paritosh has provided their driver’s license number and passed the Turo driver screening process. If you use cab all day, it will cost you a fortune. If you use Uber all day, it would still cost you more than driving my car for a day, a week or a month. So if you are like me and want to keep as much money in your pocket as I do, renting my 2015 Honda Civic LX is no brainer. 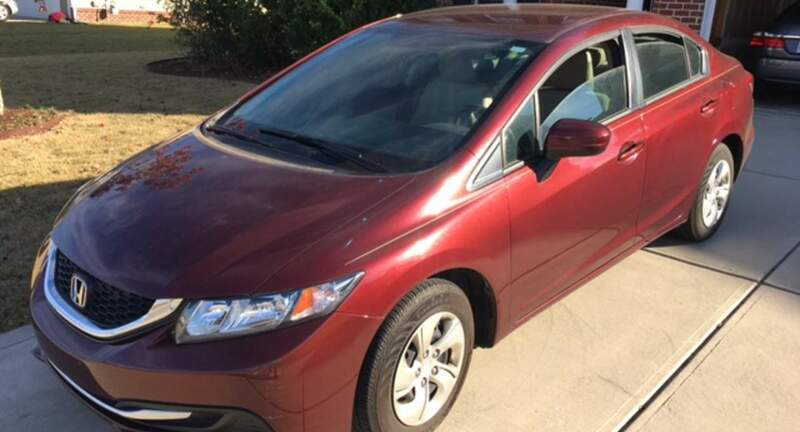 2015 Honda Civic LX is nice dependable vehicle and has great room for 4 adults. With 1.8 L 4-cylinder, 2.4 L 4-cylinder, 205 hp, EPA-estimated mileage is 35 city and 41 highway, you will not regret renting it. I average 34 mpg in city and 45 mpg on highway. The Honda Civic is one of the more popular choices in sedan category. It has got 7-inch Display Audio, single-angle rear-view camera. Additional features include: Bluetooth enabled / 4 Speakers / 1 USB Audio Interface / Pandora Capability. FAQ *********** Q: Are you able to deliver to the airport or my house/hotel/etc? A: Yes, Cost of delivery/pick-up, to/from CLT Airport is absolutely FREEEE! Delivery is also free with rentals over a week. Delivery is also free within 25 miles from 28079 & then its $5 for every additional 10 miles. (Message or text me and I can make exceptions.) Q: Are you willing to adjust the mileage limits set? A: Mileage over the reservation limit will be charged at $.75 per mile. If you&apos;re okay with that, you&apos;re welcome to go over the limits. Q: Can I bring my pet and/or smoke in the vehicle? A: Pets are allowed (you still need to clean up after them) and smoking is not permitted in the vehicle. Turo charges a smoking fee of up to $250. Q: I have another question not answered here A: For any other questions feel free to text me @ 443.821.2179 and I&apos;ll get back to you ASAP! I love the drop off / pick up part, that really came in handy as we we were getting our car worked on and without a car. It made it easier for us knowing, we didn&apos;t have to worry about how were we going to get to the car. Also, Paritosh was very flexible since we didn&apos;t know our end time exactly until our car was finished. Paritosh couldn’t have been more friendly and accommodating for our entire trip. Will definitely use him again!